Hunters Wanted: Special Rate — Call Today! Arbuckle Lodge Gillette was awarded the TripAdvisor 2017 Certificate of Excellence Award; a repeated honor after receiving the TripAdvisor 2011-2018.Certificate of Excellence Award. This award is given to the top 10% of hotels worldwide. You’re going to love it here. The guests that have stayed in our beautiful rooms tell us they can’t wait to come back. Spacious rooms. Warm, attentive service. You get all the comforts of home without having to ask for them. Guests love the flat panel television, free in-room internet, refrigerator and microwave, and comfort-top mattress with triple sheets. 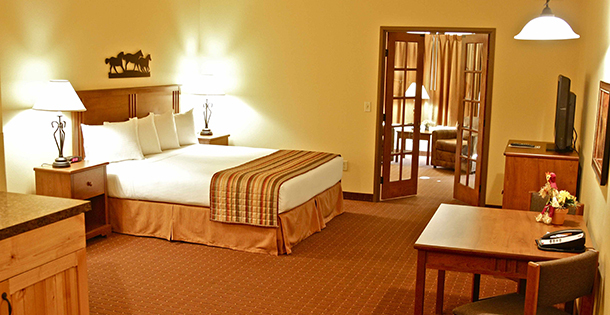 Arbuckle Lodge –your home away from home in Gillette, Wyoming. Click on the “Our Rooms” tab to see all the features of our rooms and suites.